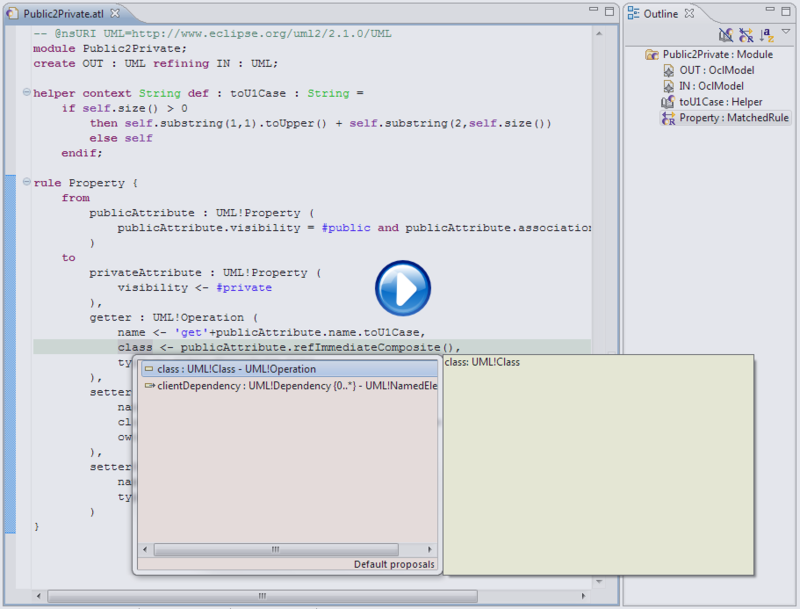 Developed on top of the Eclipse platform, the ATL Integrated Environnement (IDE) provides a number of standard development tools (syntax highlighting, debugger, etc.) that aims to ease development of ATL transformations. What can you do with ATL? ATL provides a way to produce a number of target models from a set of source models. An ATL transformation program is composed of rules that define how source model elements are matched and navigated to create and initialize the elements of the target models. You can find more details about the model to model transformation concepts here. There is a lot of ATL transformations which can be used as reference to develop your own transformations. Families to Persons (PDF version, Powerpoint version) is a kind of ATL "Hello World". The ATL Basic Examples section provides a set of basic examples and patterns. Advanced examples of ATL use are available as use cases and inside of the ATL Transformations Zoo. Read the documentation, join the discussion at the newsgroup.